Born in Dun – chu near Mt. Kailash, Western Tibet, in 1957, Tsepak Rigzin was educated at the Tibetan Refugee School, Kalimpong and the Central School for Tibetans, Simla. Subsequently, he obtained M.A in History from Punjab University philosophy at the Buddhist School of Dialectics, Dharamsala, for six years and the Library of Tibetan Works & Archives intermittently. Since joining the staff of LTWA in 1980 he has been a leading member of the research and translation Bureau. Translations into English to which he has contributed include A Necklace of Good fortune by Geshe Lamrim, Advice from Buddha Shakyamuni – Concerning a Monk’s discipline and opening the mind and generating a good heart by his holiness the fourteenth Dalai Lama, as well as sundry minor translated The Teachings of Buddha published by the Buddhist Promoting Foundation, Tokyo, Japan, from English into Tibetan. 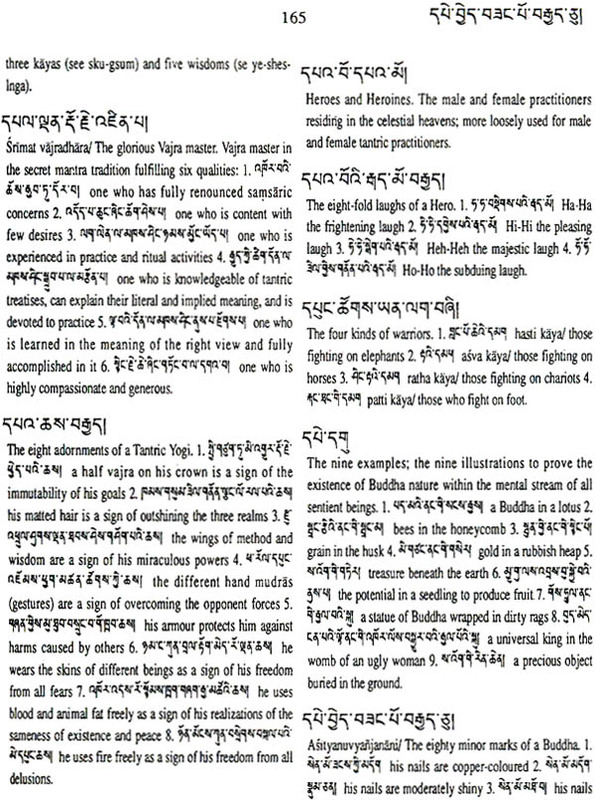 Based on the ‘Great Volume of Precise Understanding’ by brag tu rtogs par byed pa chen mo – Mahavyutpatti drawn up by Tibetan translators in the ninth century at the instigation of the Tibetan Dharma – king Tri Ralpa – Chen and supplemented from the collected works of various Tibetan lams, this Tibetan – English Dictionary of Buddhist Terminology Contains 6000 main entries and over 8000 sub – entries. Sanskrit equivalents of terms are given wherever possible in romanised transliterated form. THE English definitions largely reflect the mode of oral translation evolved in the Buddhist Philosophy classes at the library of Tibetan Works & Archives. It gives us pleasure to bring out this second edition of the Tibetan – English Dictionary of Buddhist Terminology. The present edition has been revised and upgraded since it’s first, and has been expanded with hundreds of new entrees from various sources. For example, many new words have been added to the selected lists of terms from the Mahavyutpatti (bye – brag tu rtogs – par byed – pa chen – mo) and from many other collected writings and lexicons. Attempts have been made to provide Sanskrit equivalents wherever possible in Romanised transliterated form with care. The English translations and definitions have been selected to provide a general meaning aimed at leading to a deeper understanding of Buddhist concepts. Of course, a project of such encyclopedic scope would d be exceedingly difficult to complete single – handedly, if not impossible. Nonetheless, Mr. Tsepak Rigzin of the library’s Translation Bureau is to be recognized and congratulated for his vision in undertaking such a timely project, as well as for his painstaking labour. It is hoped that this dictionary will not only serve as a reference tool but also as a handy book for providing overview of Tibetan Buddhism. Both students and scholars of Tibetan Buddhist culture will find it useful. When I was informed that a revised edition of my previous Tibetan – English Dictionary of Buddhist Terminology was due, I was immediately reminded of both the features (and the flaws) of the first edition. Having never seen myself as a Tibetan translator, I must confess that the compliments and criticisms that I have received have been extremely rewarding. The entire process of compiling this dictionary, from beginning to end, has been an extremely rewarding learning experience. Over two thousand new entries have been incorporated in this edition – all within the short period of time derived from maximum usage of my office hours as well as of my weekend holidays. With the exception of some minor editing and changes, the majority of these new entries have been directly translated from the glossary found in the three volumes of the Grand Tibetan – Chinese Dictionary. Many of the first editions redundant entries have been reduced to a minimum by giving cross references wherever possible in Tibetan transliterated form following the Turrell Wylie system of transliteration. 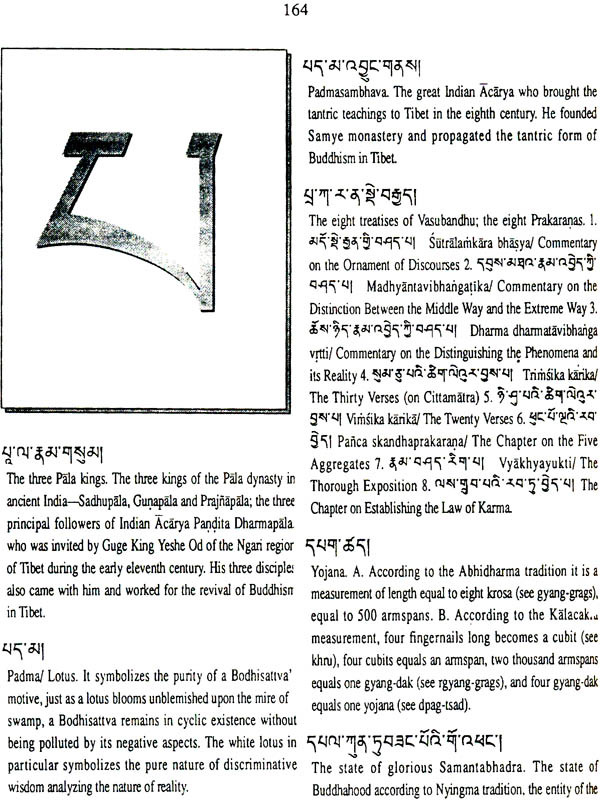 Attempts have been made to occasionally provide Sanskrit equiva – lents in romanised transliterated form based on the standard dictionaries (primarily splitting the words for better comprehension). The purpose of incorporating Sanskrit in romanised form is to enable more advanced students to go into a deeper study and research. Every care has been taken in revising and editing the not claim these to be absolutely free of flaws. Readers are therefore advised to take care and caution while using these words in all, I hope that the modifications and changes I have made will prove helpful to all readers. The unfortunate presence of any overlooked mistakes in this dictionary reflects the sheer gift of my own ignorance and carelessness. Finally, I would like to add that the production of this edition has been a gross experience of the interdependent nature of my own life and the lives of my associates. The biggest change has been the Library’s purchase of a computer (an advantage not known during its first edition); but also the assistance of many well wishers and scholars. It is to these people hat I give my inexpressible thanks: to the many teachers in my life who taught me everything from the alphabet to philosophy; Ku – Ngo Gyatsho Tshering, Director of this institute, for his unflagging interest and encouragement Jeremy Russell, for his many years of association at the translation Bureau; Ms. Marguerite Mullins for her moral support; Robert Moyer for his editorial assistance in revising the English part and Mr. Sangye Tandar, LTWA’s Tibetan Language Officer for his generous time and erudition in revising and editing the Sanskrit equivalents and for providing extremely valuable suggestions; Mr. Tsering Dhendup, our Computer Geshe for his guidance through the computer world; and finally to Scott Heftler, for finalization – design, layout, formatting, proof – reading, and incorporating corrections. Mr. Heftier’s work was done on a Macintosh classic that was kindly made available by the Tibetan Medical Institute’s Dr. Namgyal Qusar. As always, I thank all those whose moral support has actually caused me to move along with this project.